which tells us that the product 712×23 = 16376.
so that the product can be read immediately: 4566×257 = 1173462. In the case of 124576×3857, the third intermediate sum 2 + 8 = 10 takes two digits leading to an additional carry of 1 which is added to the preceding sum 1 + 6 making it 1 + 6 + 1 = 8. This settles the matter giving 124576×3857 = 480489632. The applet below offers an interactive version of the lattice multiplication. The two multiplicands appear in blue. There digits can be changed by dragging the cursor a little off center of each. 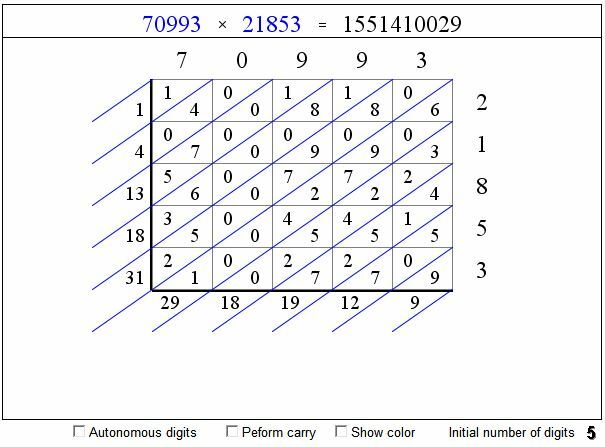 The digits can change autonomously so that each will cycle through the values 1, 2, 3, ..., 0, or be made (the default) a part of the integer string so that, for example, if a digit changes from 9 to 0 its neighbor to the left accepts the carry of 1. The length of the multiplicands is controlled by the Initial number of digits spin, but also may change as the number itself changes.